This review comes from Stargazer’s World, an RPG and general gaming blog run by Michael Wolf. He’s a long-time gamer based in Germany, and his blog has a number of great contributors. Well worth a look. The original text of the review can be found here. The review was also posted over at RPG.net. In late May the postman brought me a mysterious package from Cubicle 7 Entertainment. When I opened it, I found a copy of Dark Harvest – Legacy of Frankenstein inside. There was no note included that told me why I got sent this book and I was wondering if I placed an order by mistake. In the end I decided to contact Cubicle 7 and get to the bottom of this. And it turned out that the book was actually intended as a review copy that has been sent on behalf of the game’s author Iain Lowson. At this point I wish to thank both Angus Abranson and Iain Lowson, but not only for the free copy of the book but also for their patience and the very nice email conversations we had over the last weeks. You guys rock! Ok, now let’s have a look at the game itself. Dark Harvest – Legacy of Frankenstein is a 220-paged softcover book with a full-color cover. The interior of the book is black and white only. But even though the interior is mostly black and white, the book is totally gorgeous. I especially liked the way the book is layouted. It’s a real pleasure to leaf through the pages. From the first moment I started reading I knew this book was special. And I mean that in a very positive way. Because of the “Compatible with Victoriana Core Rulebook” sticker on the cover you might think it’s a supplement for that game, but it isn’t. Dark Harvest is actually a standalone book set into an alternate history using a simplified version of the Victoriana rules. But more about that later. It’s also a short story anthology, because the book contains five stories set into the games’ background written by various authors, including Iain Lowson. For me the absolute highlight of the book is the setting. Even if they sold just the setting without any rules, short stories, stats, etc. it would still be a must-buy. Yes, it’s that great. The focus of the campaign is the country Promethea which is the new name of what was formerly Romania. Explaining in all details what lead to the formation of this country would be beyond the scope of this review, but there’s a great overview of the history on the official site. The important part is that the newly-elected King molded Promethea into a modern state, embraced the industrial age and devoted the whole country to science and learning. Promethea also declared itself neutral and in the long run became more or less self-sufficient and closed it’s borders almost completely. Over time Promethea turned into a military dictatorship run by the King and his council. In the early 20th century nobody outside its borders truly knows what’s going on in this Balkan state. And the truth is more wondrous and terrible than anyone can imagine. The King who has been known as the Austrian-born Karl Baden is in fact Victor Frankenstein. Using the discoveries he made centuries ago he has prolonged his life, perfected his techniques and planned the greatest revenge ever concocted. He uses the land and the people of former Romania to further his plans. Promethea in 1910 is a totally different place from what Romania was in our world at that time. The ruling class of that country uses the scientific advantages of their ruler to harvest body parts from the lower classes to prolong their life, replace whole body parts to replace damaged ones or enhance their beauty. Promethea’s soldiers are also enhanced by science. They are usually larger, tougher, more aggressive than normal humans and wield weapons which are far superior to what the other European nations possess. Imagine a totalitarian regime like in Stalinist Russia but where it could easily happen that some member of the elite decides she wants to have your wife’s eyes – literally. Or where you have to give your right arm, because some soldier lost it. This goes so far that the poor sometimes scar or cripple their young in order to evade the Harvest. 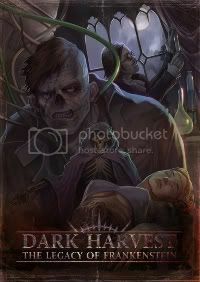 Dark Harvest – Legacy of Frankenstein is a dark game, there is no doubt about that. But it’s also extremely rich in flavor. The elaborate history of Promethea and the events leading to the formation of that state feel realistic and should excite any alternate history geek. While reading the game’s background I had dozens of great ideas on what kind of games you could run using it. Imagine a group of spies from various European nations trying to find out what happens behind the closed borders of Promethea or a bunch of Resistance fighters fighting against the regime. By the way, the book also provides information on the Promethean Resistance which is actually lead by Frankenstein’s Monster. Most people probably don’t know much about how Romania actually looks like, so the book not only provides gorgeous map but also detailed information on all Promethean provinces and the important town and villages. There’s enough detail so that any player or GM gets a good grasp of what the land looks like, but it’s not too detailed so that there’s still room for the GM’s own ideas. All in all the campaign setting is one of the best I’ve read in a while. The premise is original and both the background sections and the pieces of fictions provide a lot of flavor. If you are a buff of alternate history settings, you’ll definitely love it. The second half of the book contains the rules needed to play the game. The system utilized in Dark Harvest is a modified and streamlined Heresy game engine from Victoriana 2nd Edition. Obviously some elements like non-human races and magic have been removed and other aspects have been simplified. In Dark Harvest the story should always be the focus and not the rules. As you all well know, I like rules-light systems and at least Dark Harvest’s version of the Heresy engine is exactly that. It basically uses a simple dice pool system. In order to check if a task succeeded you take as many six-sided dice as you have ranks in the appropriate skill and add a number of dice equal to the appropriate attribute. Every die that comes up a 1 or 6 is a success. Usually one success is sufficient but more successes improve the quality of your success. Has a task higher than average difficulty black dice are added. Per every 1 or 6 rolled on one of the black dice one of your successes is removed. I like that mechanic, also I fear that dice pools might become extremely large very fast. Alas I haven’t actually played the game yet, so I can only speculate. Aside from attributes and skills each character may have various talents which grant abilities like Combat Sense, Iron Will, Quick Draw etc., Exotic Augmentations like Claws or Night Vision, Privileges like Gang Member, Hero or Union member, and Assets like a laboratory or a trained pet. If you have already spent all your available character points, you can also pick Complications which provide you with some new points to spend but also come with some hefty drawbacks. Overall rules are pretty light and the book doesn’t contain page-long lists of weapons, armor and other equipment. But there’s a quite extensive list of support cast including human NPCs and some monsters like the Augmented Bear. Of course stats for normal animals is provided, too. The appendices contain the Half-Told Tales, short story hooks that can easily played from either the side of the Prometheans loyal to the regime and the side of the Resistance. With these hooks alone any GM should have enough inspiration for a full campaign. I was also very pleased when I found an extensive index at the back of the book. Most modern RPGs usually omit this. In my opinion Dark Harvest – Legacy of Frankenstein is very impressive albeit somewhat overlooked game. I have to admit that before I got my review copy I never even heard of it. This is really a shame, because the rules are solid and the campaign setting is very well-designed and well-written. Especially if you are into alternate histories, you will totally love this game. If you haven’t already, check it out!